INSHORE/SURF/PIER- Catch and release snook fishing will no doubt be the main game in town for the better part of the summer. The snook have taken up residence in all of the usual summertime spots. Jupiter and Palm Beach(Lake Worth) Inlet, Lake Worth and Juno Beach Pier, and countless stretches of beach will be filled with snook as the summer goes on. Early in the morning or late in the afternoon the snook can be fooled with a wide variety of lures. Rapala X-Raps, Yo-Zuri Crystal Minnows, Live Target Swimbaits, DOA Bait Busters, and assorted Flairhawk Jigs are all good choices. In higher light periods try livebaits for best luck, good choices include; sandperch, croakers, whiting, greenies, and sardines. Tarpon are making their usual push north along the beaches right now, best way to catch them…be lucky! Inshore mangrove snapper fishing should be very good right now. As usual, like a broken record, fish early and late for best luck. The tricky little snapper like live shrimp, small live baitfish (sardines and pilchards), and assorted cutbaits. In shore, fishing has been good in the lagoon and with the rain the snook have become more active. Anglers are producing good catch and release action at most of the area's spillways. Taylor Creek spillway is one of the more popular spillways in the summer months. DOA Terroreyz and top water lures will get you good results there. Trout fishing north in the lagoon has been good the last couple of days, DOA Cal Minnows have been working best. Snook fishing from the south jetty at Ft. Pierce has been good the last few nights. Live shrimp with a troll rite hook have produced good catches there. Mangrove snapper fishing along the channel edges is starting to heat up a bit and live shrimp will get you good results. 06-30-11 THURSDAY: DAYS HAVE BEEN SLOW, SNOOK ARE BITING AT NIGHT. It's a real nice morning at the inlet. Winds are blowing out of the South at 13 mph and there is a mix of sun and clouds. We have more folks out on the jetties this morning so hopefully that good deal of rain we got yesterday stirred the fish up a little. Fishing has been hit or miss this week so far. Jacks, small Spanish Mackerel, Sheepshead and a couple of Flounder have been sporadic. Oversized and keeper Reds have been landed but not in huge numbers. The Snook bite has been best in the evening. Catch and release only until September 1st. We have another overcast day at the inlet today. Clouds are building to the south this morning and we will probably see some rain today. Sun and clouds are predicted all day. Take some rain gear if you head to the inlet, sometimes the bite picks up when there is rain and we need all the help we can get. There are not a lot of folks out on the jetties this morning. Winds are blowing out of the Southeast at 10 mph and the water is calm. The bite remains slow for the dinner table and spawning catch and release Snook are thick during the evening hours. A few nice fish have made an appearance but patience is a must. An occasional oversized C/R Red or even a keeper every now and then, a few Mangrove Snapper, a few Sheepshead have been landed but the bite remains slow. Tarpon have been seen in the evening hours rolling around but we haven't had any catches reported. A big Goliath Grouper that was hooked on Friday the 17th. It was estimated that the big boy to be about 150 lbs. The angler that hooked up with the Goliath handled it beautifuly. This protected species should not be photographed out of the water and the young man who caught it was knowledgeable of the strict rules for this species. The first photo shows the Goliath at the jetty, the young man reeled the fish in close to shore so he could jump into the water to release it. Nice going! They didn't get the man's name but we salute his handling of the fish. 06-28-11 TUESDAY: LOTS OF SPAWNING SNOOK! It's another overcast morning and it looks as if we will have sun and clouds all day which will help keep the temperature down. This morning winds are blowing out of the Southwest at 7 mph. Fishing is still on the slow side but there have been a few real nice fish for patient anglers who bide their time. Snook are thick mostly in the evenings but please remember they are catch and release only, it is spawning season and we need those Snook to go out and make more Snook! Please handle this species with caution as with all C/R species. If you are going to photograph a C/R fish, please use two hands to support the weight of the fish, never let the fish hang by the gills, it can damage the internal structure. Try not to handle the fish too much or with a towel, this will remove the important "slime" off their bodies. Take a quick photo and get the fish back into the water ASAP. When releasing a fish from the jetty, if no net is available, release the fish head first into the water and beware of rocks below. Inshore, Trout fishing is still good with a lot of small trout in the lagoon being taken on artificials. Some of the bigger trout have moved into deeper water and can be caught on live bait. We have heard of some redfish north in the lagoon and are taking Berkley Gulp and DOA Cal minnows. Last night at the south jetty in Ft. Pierce the snook had lock jaw, however the mosquitos turned out in full force and didn't have the same problem they were biting very well. Inshore, reports of good trout around the Bear Point area, fishing a DOA Cal Minnow on the incoming tide. The afternoon rains are bringing a little relief to the hot water condition in the lagoon. As the summer rain becomes a more regular pattern you can expect more action for snook and mangrove snapper in the inlet and along the channel edges. No one can explain it, but the flounder bite remains exceptional in and around the Sebastian Inlet. The bite over the past few weeks has been as good if not better than anytime in December, the usual height of the flounder season. Best bet is to fish a DOA CAL or Gulp bait on a 1/8-1/4 oz jig heads. Use a slower retrieve and bounce the bait off the bottom. Over the past few weeks slot size reds have been a little hard to come by but recently they have been making a comeback and have been seen in some decent sized schools. The only problem is they have been real picky making a chance for hookup on artificial nearly impossible. Try using live shrimp on a jig head or cut ladyfish or pinfish. Chum up the area pretty good and position the boat ahead of the school for the best chance for a hookup. Choose the tides right and you are sure to catch a big fish of several different varieties at the Sebastian Inlet right now. Snook are about to spawn and have been thick and very hungry towards the end of last week. Be gentle as these species are spawning so please handle them with care especially when fishing and releasing them from the jetty. Big schools of big jacks have also been moving in and out of the inlet busting on schools of greenies. You can usually tell when the jacks show up as they will move in and destroy a school of bait making a huge show of it. You can throw just about anything in the middle of that action and get ready for a hook up. Besides snook and jack, some monster Tarpon have also been around as they make their way onto the beaches. Expect to see the Tarpon over the next few months move in and out of the inlet as they continue to spawn offshore on new and full moons. Fish along the mangroves for snook and redfish with DOA shrimp, CAL jerk baits and top water lures where the water will be 2-3 feet deep. Trout will move to deeper flats in 2-6 feet of water and will most likely hit pigfish, DOA shrimp or Deadly Combos. Look for the trout to move to the deeper edges of the flats as the sun warms up the water. Fish the sand holes on the flats! You will find the bigger fish sitting in these holes waiting on the tides to bring the food to them. Redfish will continue to hold up on the flats. Read the water as you move across the flats and look for any activity that might be a school of reds. Gold spoons, soft baits, like DOA shrimp or CAL jerk baits will work best for them. Search along the docks during the day for snook or redfish hanging around there as well. It’s a fantastic month to be fishing! Areas to fish in the river for July: Bear Point, Queen's Cove and Round Island. South of Harbor Branch will be a great area to work for trout in the mornings before the sun heats up things. The flats in front of the power plant taper off to 3-5 feet and will be holding trout during the day. Live pigfish are the favorite food for trout this time of year. It’s time to set the traps to feed these hungry fish! Try a DOA TerrorEyz during the day also for trout. The west shore down there will be good areas to search out redfish. Channel edges will be yielding snapper on structure. Tripletail will be around channel markers and pilings to the south towards Jensen Beach. Have a fun month out there! INSHORE/SURF/PIER- It’s hot outside and that has the inshore fishing just about shut down. Snook fishing is good around the inlets. Live bait, like croakers and sandperch, will rule the daytime bite. At night those tricky linesiders can be fooled on assorted diving plugs and flairhawk jigs. The mangrove snapper are biting fairly well inshore and around Jupiter Inlet. The bonita are making their summertime invasion of the pier. A few whiting and croaker hanging around in the surf. Getting low at Southern Blvd. We've got another warm, sunny day ahead of us. This morning winds are blowing out of the East at 7mph and there is a light chop on the water. The Snook bite remains pretty strong but they are all catch and release, so use care when handling and photographing them. A few catch and release oversized Reds, Mangrove Snapper, Pompano, Bluerunners, Spanish Mackerel and Jacks have been coming over the rails but fishing is on the slow side for shore based anglers. Inshore, snook fishing in the inlets on the east coast has been very productive on live bait. The St. Lucie inlet has been very productive for some great catch and release action. The trout and redfish reports have slowed quite a bit. Water temperature and the incredibly hot air temperatures have kept anglers off the waters of the lagoon. You will want to get out in the early a.m. to try and beat the heat. It's a real pretty morning at the inlet. Winds are blowing out of the South at 8 mph and the water is calm. Small varieties of fish have been landed over the past week. There have been lots of catch and release Snook being landed on live shrimp. Please use care while handling and photographing catch and release species. Place one hand under the belly and one under the jaw to support the weight of the fish. Never hold one vertically; it damages the internal structure of the fish. Never hold a C/R fish by the gill covers. Right at dusk, huge schools of Jacks started moving through and swimming all around the north jetty. The Jack bite came after dark inside the inlet. but warm day ahead of us today. Winds are blowing out of the Southeast at 5 mph and the water is very calm. It's a great day for fishing off the beach, jetties or a boat. We may see some clouds mixed in this afternoon but chances of rain are low. landed but nothing in huge numbers. Mangrove Snapper, Atlantic Spadefish, a real nice Flounder every now and then, Bluerunners, Pompano, a few Black Drum, Margate, Spanish Mackerel, Jacks and those big Tarpon are showing up again. Huge Goliath Grouper are out there and please remember that they are a protected species. If you hook up with one, try to release it and photograph it in the water. A report of off the north jetty a monster Snook caught using a small shrimp on 2/0 hook only to have a massive Shark come to the surface and devour the entire Snook! Atlantic Spade and Mangrove Snapper. Inshore, snook fishing yesterday dropped off a little although a few were caught and released from the south jetty. Trout fishing in the lagoon around the sand holes continues to produce. Live pigfish and soft plastics have been working on the flats, mostly north in the lagoon. What a beautiful morning at the Sebastian Inlet. Winds are blowing out of the West at 5 mph and the water is as smooth as glass. The summer is bringing us those steamy afternoons mixed with the occasional thunderstorm so the mornings are best for getting out and wetting a line. Today would be a great day to get out and do some surf fishing. Over the weekend fishing wasn't real great but there were a smattering of a good variety of species landed. Mangrove Snapper, Reds, Bluerunners, Spadefish, Margate, Flounder and Snook all came over the rails. There are a lot of greenies in the water and this morning one lucky angler landed a large Flounder. INSHORE - The inshore fishing has slowed some with the full moon this past week but, hopefully things will get back to normal next week. The reports I have been getting are all about the trout in 2 to 4 feet of water -- just off the grass flats. The trout have been taking pilchards, pigfish or a shrimp. There is still a good redfish bite along the docks of South Indian River Drive. The only thing is you will have to work hard to get one. I did get a couple of reports of tripletail coming from south of the power lines. They were also taking a live shrimp and fish the channel markers. There were a few nice flounder caught at the South Jetty and they too were taking live shrimp. As summer sets in on the Treasure Coast, the winds are dying off and we can expect warm weather the rest of summer. You can count on the chance for afternoon thunderstorms each day, so plan your adventures to take than into account. The earlier you can get out on the water....the better! Have fun the rest of the month and get in some good fishing time. It's a great time of year. Trout fishing remains good using DOA shrimp, CAL jerk baits or live pigfish. Most flats continue to hold trout in two to five feet of water. Look for bait schools for the best productivity on the flats. Redfish are also feeding on the flats or under the docks. Had the winds cooperated a little longer we would certainly fished the docks most of the morning. Getting out before sunrise can give you an excellent opportunity this week to use top water lures. We have entered that phase of summer weather where it will be flat calm most mornings. It's always inspiring to watch that sun peek over the horizon. Lots of sheephead and snapper around structure right now. The mangrove snapper have been good table size lately. Live shrimp is hard to beat for these fish. The weather has calmed down this week, so plan a trip on the river soon! Drink plenty of liquids out there. Keeping hydrated is very important this time of year. INSHORE/SURF/PIER- Its summertime, and with the exception of the catch and release snook fishing it is a little slow right now. With hot air temperatures come hot water temperatures and very slow moving fish. No matter what your target species fish early morning, late afternoon, or even try the night bite. The snook are taking up their summer homes in the inlet and along the beach, and they are showing up in good numbers. Live croakers, whiting, and sandperch are your best be for some big snook bites right now. If your into lures try Rapala X-Raps, white bucktail jigs, and soft body swimbaits. The summertime resident spanish mackerel are hanging around the pier. Small livebaits and longshanks hooks are the ticket for them! Otherwise, it is a slow pick on everything else…just have to get out and try! Our latest news on fishing at the Inlet includes quite a variety of fish caught, including Spanish Mackerel, Mangrove Snapper, Redfish, Blue Runners, Flounder and Margate. Most common bait used: shrimp, squid, and cut mullet. A photo of young angler Chris with a mangrove snapper he caught off the catwalk. It may feel like summer to us but the flounder must think its December with the amount and size of some of the flounder coming into the shop. Nobody tell them otherwise in hope that the flounder bite over the past few weeks continues. Those wading the grass flats working jigs slowly have had the best luck with artificial of choice being the DOA Cal Shad on a 1/8-1/4 oz jig head. We prefer Arkansas Gold or Black / Gold here at the shop. The flounder may be down below but the trout are definitely up on top with a great morning topwater bite. Back in the river the tarpon bite has remained steady but the fish are starting to move into the inlets and beaches. Try slow trolling a live mullet or if anchored up split tail one and drop it on the bottom. Daytime inlet fishing has been spotty with best times to fish being early mornings and early evenings depending on the tides. Snook, Tarpon, and Reds have been the main attraction at night with big bull sharks ruining the party for many catch and release anglers bringing in half a fish or having to watch their carefully released fish become dinner. Of course it sharks are what you are after no better time than right now to hit the inlet with a big bonita, ladyfish, or similar. Inside the channel mangrove snapper and sheepshead have been the best bet mainly on live shrimp. Inshore, anglers targeting trout have found that the bait of choice has been live pigfish. The heat of the last few days has provided late afternoon and early evening action on trout, snook and redfish in the lagoon. We have heard reports of some excellent snook fishing in the Ft. Pierce and St. Lucie inlets, which is not uncommon in the summer months. The afternoon thunderstorms continue to stimulate a good fish bite. Today the water is clean with beautiful conditions. A breeze is picking up which makes the heat more bearable. Mangrove Snapper continue to bite despite the large Snook looming around. Most of the Snapper are small. The Spanish Mackerel are also still moving in and out. Today's best bait is live shrimp. Inshore, on the south jetty last night the action focused on black margates. Anglers using live shrimp were catching buckets full of the tasty critters. Jack Crevalle have also been in the inlet along with snook. Live bait has been producing snook along the dock line south in the lagoon. Artificials have not been particularly good in this record heat wave. You will want to get your fishing in early to try and beat the afternoon thunderstorms. Thunderstorms late yesterday turned on the fish bite. Spanish Mackerel have moved in to compete with the Snook over Gotcha Lures worked along the rocks. Snook do prefer the live baits while the Mackerel can't resist the lures. The Mangrove Snapper also started biting after the storm. Look for more of the same today. Snook are starting to show up in large numbers. They are hitting a variety of offerings such as jigs, shrimp, finger mullet and pinfish. They make for great catching action but must be released. The Snapper bite is slowing down probably due to the influx of big Snook. Best action is early morning on the first incoming tide. The next two mornings are setting up to be perfect windows for good action on the jetties. There have been some very nice sized TARPON and PERMIT on the north side of the Boynton Jetty, so if your feeling lucky....float one of these, and "HOLD ON"
Conditions are calm and muggy on the jetties this morning. While the fishing is not explosive, there is a regular catch of a large variety of fish. Mangrove Snapper continue to cooperate as well as a few Pompano, Redfish and Flounder. Blue Runners and Margate are keeping anglers active. The Margate is a large grunt, sometimes called Sailors Choice in Florida, like the Pinfish. Summer weather has certainly arrived. We did have some windy days this past week, but the temperatures are definitely on the warm side. A little breeze is always welcome on those warm days! Plan on early mornings or late evenings for your best fishing chances. Trout has continued to be the best bite on the river. Most of our fish have come in two to five feet of water and a lot of times they have been found just on the edges of the grass flats. DOA shrimp and CAL jerk baits have proven to be successful on the trout. If you are using live bait, get out the fish trap and catch some pigfish this time of year. They will give you a much better chance on the trout than even shrimp. Fish them under a popping cork for best results. An angler caught the largest trout of the week a 26" fat gator trout. 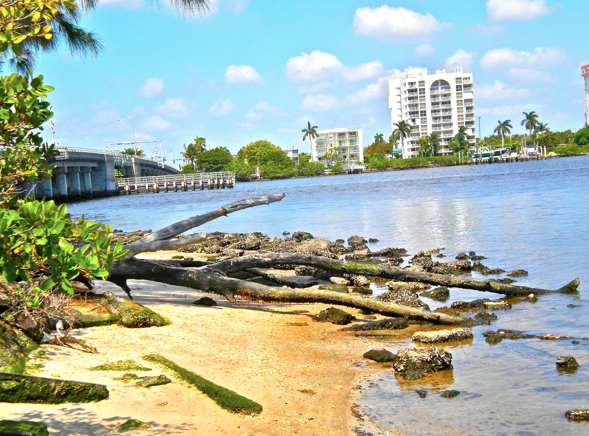 Queen's Cove, Harbor Branch and the west shoreline on the south side of Fort Pierce have all been productive for trout. We did manage a few redfish earlier in the week. You can find some hanging under docks or out on the flats. We had several break offs under some of the docks. Lots of snook are holding under the deeper docks, but can present a challenge in getting them out from under the maze of pilings. There are still plenty of sheephead in the river along with mangrove snapper. Check under docks or around the bridges for some of these tasty characters. It's a great time of year to be fishing the Treasure Coast! Inshore- Catch and release snook fishing is really good right now, and will only continue to get better. The inlets are filling up with fish, but not all have made it yet. That means the bridges, beach, and even mangroves are still holding some fish. They are hungry right now, so a wide variety of baits and lures should work on them. Take a little extra care in releasing those big females this time of year, they need all the energy they can get to start dropping those little snooklets! Jacks are cruising all over the place inshore right now, and love to crush a topwater around seawalls early and late in the day. Mangrove snapper have started to bite good in the usual summertime spots. Surf/Pier- It may be June, but nobody told the big schools of pompano hanging around still. The pier has been producing good numbers of fish on Doc’s Goofy Jigs, shrimp, and clams. Bite is good early and late, with some fish in the middle of the day. Not sure how long this will last, so get them while they are hanging around!!! The snook are cruising the surf and harassing the bait schools around the pier. They may be out of season, but it is still fun to trick them on a topwater along the beach early in the morning. Tarpon are starting to make the summertime move north. Activity is picking up for many species at the inlet. Mangrove Snapper have turned on as well as a lot of bait stealers such as Blue Runners, Catfish, Spots and Spade Fish. Pompano and Black Drum are starting to show up now. Should be an active weekend for the shrimp dunking crowd! Winds are blowing out of the Southeast at 12 mph this morning. Yesterday the bite on the north jetty was pretty slow for table fare. Enormous C/R Reds and C/R Snook are being landed during the day and at night but the Mangrove Snapper bite sort of died yesterday. There's not a lot of bait in the water and that is unusual for this time of year. Inshore, summer time conditions persist, so an early morning fishing trip will provide you with some good results. Trout and snook are on the flats and a few redfish have also been reported. Top water and soft plastics have been working well in the early A.M. We are still getting reports of a lot of small trout in the lagoon right now and we are hearing some reports of tarpon along the beach and the inlet. This afternoon winds are blowing out of the North Northeast at 17 mph and there is a pretty good chop on the water. Fishing has picked up a little in the past few days but it's still not what we usually see at this time of year. We've seen a lot of Atlantic Spadefish, Mangrove Snapper are getting thicker, Bluerunners, small Flounder, oversized Reds and C/R Snook. Monday on the north jetty, Mangrove Snapper, small Flounder, a couple of big Reds and huge C/R Snook came over the rails. Live sardines, croakers and live shrimp were the baits of choice. The memorable snook kill in 2010, due to sustained cold water temperatures, has impacted the fishery differently on both coasts. Stock assessments show that Gulf breeding stocks took a stronger hit than Atlantic coastal waters. On the Atlantic side, access to deep water and accompanying warmer temperatures helped survival rates during winter. In the Everglades, results show that snook catch rates have not been this low since before 1991. Based on the information gathered, FWC commissioners are considering four options listed below. Commissioners favor a "bicoastal" approach which uses Option A for the Atlantic coast and Option D for the Gulf coast. This would open the snook fishery to anglers on the Atlantic on September 1. For Gulf coast anglers this would set back an opening until August 31, 2012. If harvest remains closed, the commission may consider refunds for snook permits. Email your FWC Commissioners and let the know what you want to see happen with the Snook Fishery. 06-07-11 GOOD NEWS ON THE SNAPPER BITE! Well, it looks like the Mangrove Snapper bite is giving anglers lots of action. Most have been hitting shrimp as the favorite bait. Also, there were several large Redfish caught yesterday. They were too large to keep or eat, but they provided lots of fishing fun! The trout should continue to be biting in the early mornings on the flats. Getting out early can make your trip much more successful. As the sun warms up the flats each day, you will find the trout moving into deeper water. Fish the bait schools. Lots of glass minnows are in the river and fishing the edges of the bait can be very productive. Try a DOA shrimp fished very slowly and you should have good results. Redfish don't mind the warmer water and you should be able to find them throughout the day. Fishing docks this month can be very productive for many species. Snook, jacks, redfish and others will be hanging under the docks for an easy meal. A DOA shrimp or TerrorEyz can find some nice sized fish under some of the docks. It's a great time of year to fish the Indian River! A nice early run of Pompano has hit the Juno Pier the last two days, I was there today about mid day and they where too. A lot of people think they don't run in the late spring and summer, but Iv'e caught quite a few doing this time of year. Their not there all the time but when THEY-ARE, THEY-ARE, like today. There where some good size fish being caught. I left about 4pm but the Pompano didn't. There also where a few manta rays swimming around, one came down close to the beach and up by the pier >>>>>> 3 cobias where with it but everyone was fishing for pomps NO COBIA RIGS, NO LIVE BAIT, NO NOTHING, so they just swam away, like the swam in. Capt. Joe has a bait and tackle shop which is located on "C" dock at the Dockside/Harborlight Resort on South Hutchinson Island in Ft. Pierce. The address is 1160 Seaway Drive. Bobcat swimming in the Indian River. Mark Schwartz with a 32" trout caught by his brother Terry Schwartz. At the inlet the snook and redfish catch and release action has been hot. Snook season does not open until September 1st but the snook have been thick with the jetty anglers fishing the last of the incoming night time tide using a Gulfstream Flair Hawk tearing it up. Oversized Reds are thick as well with the best bet as usual being a live pinfish. Inside the inlet, mangrove snappers and sea trout have been steady as well with lots of mangroves on rocky shorelines and channel ledges. We have had a good amount of reports on some nice sized trout with a strong morning and afternoon bites. Rapala SkitterWalk in Bone has led to a great topwater bite in the morning with a nice sized pinfish over the potholes on the grassflats being a best bet in the afternoon. Taylor Ramsey breaking in a Stradic CI4 on one of our new Lagoon Custom rods with a nice flounder. If you are after snook hit the docks and mangroves as the snook bite has really been on fire. Our bait of choice has been a DOA CAL Shad in Arkansas Glow on a 1/4 jig head. We like to put a little PRO-CURE scents on all our artificials. Stop by and pick up a bottle and give it a shot and you too will be a believer. Remember, snook is catch and release only and please treat your catch with care in order to preserve the species. One surprise this year has been the recent flounder bite. These things have been all over with regular catches of nice sized fish being reported daily especially off the small fishing pier in front of the shop at the Sebastian Yacht Club. As you can see DOA CAL'S work for the flounder too with most anglers fishing the pier working nothing more than a small piece of dead shrimp on a small gold hook. In the Sebastian River, the tarpon remain. The tarpon are as tricky as ever with some days the bite being red hot and other days anglers being surrounded by rolling tarpon in all directions all of them suffering from lock jaw.